Isis, the mobile commerce joint venture created by AT&T, T-Mobile and Verizon, has revealed the first of its local merchant partners across Austin and Salt Lake City. Austin: 34th Street Café, ABC Home & Commercial Services, Austin Diamond District, Ben White Florist, Book People, Brodie Park Market, Chez Remy La Sandwicherie, Dogadillo, DoubleDave’s Pizzaworks, Downtown Burgers, Elbe Body, Iron Works, milk + honey spa, Rosemary’s Catering, Round Rock Express, Texenza Coffee, Touch of Sass, Twin Liquors and University Co-Op. Salt Lake City: Barbacoa Mexican Grill, Bohme, Cactus and Tropicals, Caputo’s, Deseret Book, Eborn Books, Great Harvest Bread Company, JMR, Lola Bella, Maverik, McKay Diamonds, Mini’s Cupcakes, Oakridge Country Club – private club for members, PGi Services, Salt Lake Running Company, Sugar House Coffee, Supersonic Car Wash, Utah Transit Authority, Utah Woolen Mills, Weller Book Works, Zagg and The Larry H. Miller Group, including All-Star Catering, Energy Solutions Arena, Fanzz, Larry H. Miller Megaplex, Larry H. Miller Automotive, Miller Motorsports Park, Salt Lake Bees, Spring Mobile Ballpark and Utah Jazz. This summer, consumers in Austin and Salt Lake City will be able to walk into their AT&T, T-Mobile or Verizon stores, choose from a selection of NFC-enabled devices and walk out of the store with the Isis Mobile Wallet enabled and ready to use, according to Isis. 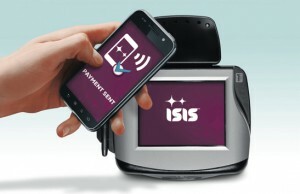 The carrier retail locations will join the local and national merchants supporting the Isis Mobile Wallet.